When we revamped our website back in 2002, we had a rather unique goal in mind. In addition to communicating to our current and prospective customers our product line and full range of manufacturing capabilities, we also wanted to provide the most comprehensive technical information regarding anchor bolts and construction fasteners that could be found anywhere on the internet. What inspired this vision? It was our belief that the unparalleled technical information we offer via our website would provide us with credibility to companies that may have had no previous interaction with us. We believed that this sense of trust would potentially open dialog that would one day result in long-term relationships, which are essential for any successful business. So, who benefits from the wealth of technical information found on our website? Lots of companies. In addition to contractors, fabricators, OEMs, and fastener distributors, the group of companies we expected would benefit most was engineers and architects. So how do engineers and architects benefit from the technical information found on our website, available via our live chat feature, or accessed through talking directly to one of our Estimators, our Certification Manager, or our General Manager? Nonstandard construction fasteners are highly technical. There are numerous standards organizations and specifying committees that govern the bolts we manufacture. These organizations include ASTM, SAE, AASHTO, AISI, ANSI, ASME, IFI and others. Within each organization there are numerous specifications covering different aspects of fasteners including application, strength requirements, chemistry, tolerances, markings, surface finishes, compatible nuts and washers, etc. Engineers and architects don’t work with these specifications each and every day like we do here at Portland Bolt and could never be expected to know everything there is to know about bolts. That’s where we can help! The FAQ section of our website is a wealth of technical information. Our experts working collaboratively in our main office are trained to field your technical questions and provide you with answers. Although we don’t have engineers on staff here at Portland Bolt, we can certainly provide assistance when it comes to clarifying technical aspects of the various specifications and provide information about what can and can’t be done (easily) from a manufacturing perspective. We can also provide you with budgetary pricing and brainstorm to help find solutions to the most difficult challenges. Our free technical support is available Monday through Friday from 6:00 am – 5:00 pm Pacific time, Monday through Friday. If you are an engineer or architect who contacts us for technical support, we understand that you are rarely responsible for procuring the bolts and fasteners you specify in the structures you are designing. Our hope, however, is that you will pass our name along to contractors as a potential source for these materials. When Portland Bolt is involved in manufacturing bolts for your projects, you can rest assured that the bolts will be made correctly, will arrive on time, and will be accompanied by all of the appropriate certification documents. Contact us today! Are you an engineer or an architect that would like to contribute fastener-related information or education to the 30,000+ recipients of our bimonthly newsletter? If so, we would welcome your contributions. If you have a brief topic of interest that you would like to write about that would benefit the thousands of contractors, fabricators, fastener distributors, and OEMs that subscribe to our newsletter and frequent our website, please contact Greg Lindsay at (800) 599-0565 | greg@portlandbolt.com. There are a variety of processes involved in the manufacturing of a construction fastener. Many companies are capable of cutting round bar and threading it. Fewer have bending capabilities for manufacturing eye bolts, U-bolts, right angle bend anchor bolts, and other types of bent fasteners. Only a handful of companies that manufacture bolts have a hot-dip galvanizing line in the same facility in which their bolts are manufactured. Portland Bolt possesses all of these capabilities as well as plate processing and light fabrication. 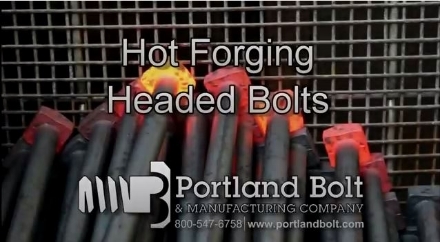 However, the operation that truly separates Portland Bolt from the vast majority of other manufacturers in the construction fastener industry is our ability to hot forge heads onto bolts. There are only a handful of companies in North America that possess the facility, equipment, and expertise necessary to manufacture headed bolts. Our newest video will provide insight into how headed bolts are manufactured, industries in which headed bolts are used, various types of headed bolts, and the advantage of headed bolts versus rods with welded nuts. Portland Bolt manufactures a variety of different fasteners for bridges throughout North America. Most are traditional steel or concrete structures, while others are extremely unique. Such is the case with the Souris Swinging Bridge located in Manitoba, Canada. When flood waters damaged Canada’s longest historic suspension bridge, Portland Bolt was called upon to manufacture a variety of fasteners to rebuild this iconic pedestrian bridge. Read more….